June and July, September through January. 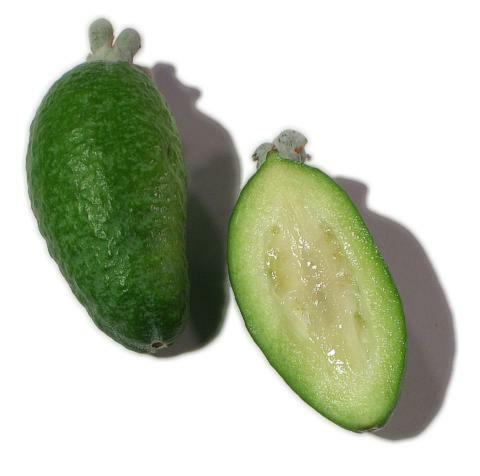 Although related to the guava, the feijoa is unique. It has a sweet, aromatic flavour. The flesh is juicy and is divided into a clear jelly-like seed pulp and a firmer, slightly gritty opaque flesh nearer the skin. The feijoa is native to extreme southern Brazil, northern Argentina, western Paraguay and Uruguay where it is common wild in the mountains. It is believed that the plant was first grown in Europe by M. de Wette in Switzerland and, a little later, about 1887, it was known to be in the Botanic Garden at Basle. In 1890, the renowned French botanist and horticulturist, Dr. Edouard Andre, brought an air-layered plant from La Plata, Brazil and planted it in his garden on the Riviera. It fruited in 1897. Dr. Andre published a description with color plates of the leaves, flowers and fruit, in the Revue Horticole in 1898, praising the fruit and recommending cultivation in southern France and all around the Mediterranean area. A nurseryman in Lyons distributed air-layers from the Andre plant in 1899 and many were planted on the Riviera, some in Italy and Spain and some in greenhouses further north. That same year, the prominent nurserymen, Besson Freres, obtained seeds from Montevideo and raised thousands of plants which were widely sold and proved to be of a different type than Dr. Andre's plant. Seeds were imported by one or two other French nurserymen, and then, in 1901, seedlings from Dr. Andre's plant were obtained by Dr. F. Franceschi of Santa Barbara, California, from M. Naudin of Antibes. These were planted at several different California locations. In 1903, Dr. Franceschi acquired, through F. Morel of Lyons, several air layers from Dr. Andre's plant. He planted 1 or 2 at Santa Barbara and most of the rest were sent to Florida. The plant did not succeed in southern Florida but became quite popular in northern Florida, primarily as an ornamental and particularly as a clipped hedge. Dr. Henry Nehrling had two plants growing well in a shed in half-shade at Gotha in central Florida, in 1911. They flowered and fruited but the fruit dropped before maturity and rotted quickly. In recent years, the cultivar 'Coolidge', vegetatively propagated, has borne well in Florida. In California, the feijoa is grown in a limited way for its fruit, especially in cool coastal locations, mainly around San Francisco. At the Experimental Station in Honolulu a plant flourished for 15 years without bearing fruit. Later plantings have succeeded at higher elevations. The feijoa is sometimes cultivated in the highlands of Chile and other South American countries and in the Caribbean area. Jamaica received a few plants from California in 1912 and planted them at various altitudes. I have seen occasional plants on roadsides and in private gardens in the Bahamas, but they do not fruit and often fail to flower. In southern India, the feijoa is grown for its fruit in home gardens at temperate elevations�about 3,500 ft (1,067 m). Nowhere has the feijoa received more attention than in New Zealand. An Auckland nurseryman introduced 3 cultivars from Australia�'Coolidge', 'Choiceana', and 'Superba'�about 1908. They remained little known until 1930 when the feijoa was advertised as an ornamental plant. Later, after improvement by selection and naming of types with large, superior fruits and their vegetative propagation, small commercial plantings were made in citrus-growing areas of the North Island. The New Zealand Feijoa Growers' Association was formed in 1983 and some fruit is being exported to the United States, United Kingdom, Germany, Netherlands, France and Japan. New Zealanders also plant the feijoa as a windbreak around wind-sensitive crops. It is planted as an ornamental and for its fruit in southern Africa. Following WW II, feijoa plantations were established in North Africa, the Caucasian region of southern Russia, as well as in Sicily, Portugal and Italy.